The home has recently been made available for rental as it was previously on the real estate market for sale. 1) Bike to the beach, pool, Durante Park, nearby wonderful restaurants and convenience stores. 2) One of the largest homes in the resort with room for up to 8 guests. TWICE the size of the other rentals in resort. 3) No resort fees or pet fees. 4) Highly rated mostly 5 star by prior guests. RARE WINTER VACANCY: we had planned on selling this wonderful home at years’ end but have postponed it until next year and just opened winter dates that had been blocked off until now. In December 2017 we did $70,000 of upgrades with new exterior painting and siding, both lanais have been completely redone, bathrooms regrouted and many rooms repainted. 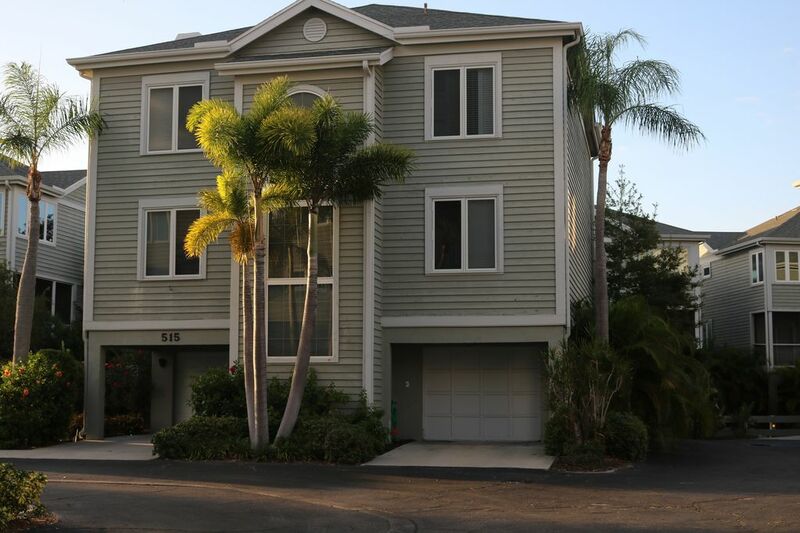 Likely the most spacious rental you can find on Longboat Key at a reasonable price. Rare double sized unit, 3000 sq foot freestanding condo home in Cedars Tennis Resort. A tropical paradise in a vacation destination with fishing pier, jr olympic pool and pair of aluminum bikes in garage to bike the trails in nearby Durante Park and alongside Gulf of Mexico Drive. Barbecue grillers in garage for your use as well. Three levels to spread out so two families can rent together without feeling cramped in. Ideal rental for young and old, with beachgear in garage for the kids, puzzles and games in family room .At less than the cost for two hotel rooms, we have so much more to offer. If you have rented at Cedars before, this unit is twice the size, twice as spacious for a nominal amount more. Kitchen walls and 4th bedroom/ study updated in soft yellow, newer carpeting in sky blue color, new beach pictures, outdoor lanai furniture, some new appliances in full gourmet-like kitchen fully stocked with utensils, dishware and cooking items. KID FRIENDLY with high chair, port-a-crib, sheets at no additional costs. Kids toys in unit. BEACH GEAR including umbrella, chairs, boogie boards, plastic playgear for kids in the unit's 2 garages. Huge hammock on upper deck balcony just added to lounge in. Huge kitchen/family room with 42' LCD TV. Cable TV in most bedrooms. Hi-speed /WiFI Internet included Peek-a-boo views of the Gulf of Mexico from two of the bedrooms. Jacuzzi in master bath with his and her changing rooms/powder area. King size bed in master with lanai porch overlooking pond. Two other bedrooms on top level with queen bed in one and twin beds in other. Fourth bedroom on second floor (daybed and trundle open up to two beds) serves as a study as well, ideal for the teenagers or for those who wish to stay up late and watch movies on the bigscreen LCD TV in adjacent living room/family room. If there are 9 or 10 guests, a high quality inflatable queen air matress with pillow top can be placed in master bedroom or in living room. clean, beachlike feeling and room to relax. Whether you stay at the resort by the pool all day or the nearby beach or attend the cultural activities in Sarasota, you'll be delighted to stay in the beautiful surroundings that the Castle has to offer. Inquire directly with owner for more information regarding tennis availability offsite in Longboat Key. My wife and kids love Longboat Key for the beaches, the sea life and the wonderful restaurants. When you are on the island your stress level drops and relaxation just seems to occur naturally. There are peek a boo views of the beautiful gulf; you may walk to the pier as well as places to eat, as well as the pool and nature car needed. We like to spend a day at the beach, followed by a swim in the pool, fresh tuna or mahi mahi on the grill and then catch the fiery red sunset over the gulf. The house is beautiful, roomy and comfortable. I fell in love with the kitchen. While this house has more room for a larger family than most of the properties we looked at on Long Boat Key, it didn't have the access to beach and activities we had anticipated. When looking at the site, it appeared to have walking access to tennis and the beach and this was a prime reason for the booking. Both of these turned out to be a drive away, by over a mile. The house was stocked with the main amenities for the kitchen, linens, and beach toys so that was a benefit. It could use some updates since some of the plumbing and faucets didn't function very well. We also had WiFi intermittently and it went out for most of the stay. Nothing is better than getting out of winter weather and relaxing at upscale Longboat with family. Fortunately we stumbled upon this rental and were very glad we did. Let me first say that I was very appreciative that the owner, Phil was caring enough to inquire with his cleaning staff to see if they had found my mother's wedding ring and then mail it back to her at no cost in its original condition. He didn't have to do that and I don't think most rentals would even care to check. The home was very accommodating for the 6 of us; my husband and I and our teenage boys and my parents. It's one of the few places we have vacationed that seems to have enough to do for multi-generational families. Nearby was the beach for my kids, the pool and fishing pier for my father (80 yrs old) and golf and tennis for my husband. St Armand's circle was 10 minutes away and is a favorite of my mother and me for shopping and restaurants. We loved the Columbia Restaurant and I especially enjoyed Wyland Gallery for marine life art. The home is very relaxing and comfortable with open space to be together or four bedrooms if you need privacy. The bikes and beach gear came in handy for all of us. I wouldn't hesitate to return again and stay for two weeks if school schedule would allow it. Two thumbs up for castle-in-the-sky! This is our second visit to Castle in the Sky at Longboat Key. Even though there were several years between visits the property still looks as good as it did in our original visit. The property is very large and has an open kitchen and large dining area and can easily accommodate 10 people comfortably. The location near the beach and shops is excellent and the owner is very nice and responsive. We fully recommend Castle in the Sky for a wonderful vacation on Longboat Key. Thanks so much for the kind review Kirk. Perhaps a bit "over the top" in your praise for the home but we are most appreciative of the time you took to send the review and are so happy to have had a chance to meet you and your family this past stay. We hope to see you again next year and show you some of the hidden treasures the area has to offer that only the locals as myself can reveal to wonderful guests like you. Can't Wait to Return to Castle in the Sky!! My family of four loved our trip to Longboat Key. What made it so special was our rental of Castle in the Sky. This home was more comfortable than my own! The kitchen was well stocked, the beds extremely comfortable and there was room for all of us to spread out!! We loved the pool and biking every evening!! The owner was a pleasure to work with, anything we needed was immediately taken care of. The location was excellent. We're already booking our trip for next season, we can't wait to return!! Thank you for the kind review Sue, and very happy to hear that your family had a great stay. We look forward to your family returning this spring. Happy Holidays until then. My parents rented this place for a month March 2016. They rented large place so that friends and family could visit while they were there. I visited for a week in early March. The first thing my Mom said to me when they picked me up at the airport was an apology for the condition of the condo. I assumed that she was exaggerating, but when I arrived, I was appalled. Th place was filthy. The floors appeared to have not been swept in ages. There was dirt, crumbs, pet hair etc... everywhere. My Dad had tried to sweep, but the vacuum that was in the unit did not function. My Dad contacted the owner via email and the owner responded with a link to a youtube video on how to clean the vacuum. Seriously? After a few more complaints, the owner dropped of a "new" vacuum while we were out. The next day, my folks went to the airport to pick up my sister and I spent the day cleaning. The wood floors had spots were obviously stuff had been spilled and never cleaned up, the dust on the wall hangings, baseboards, window sills was so thick, it looked like fur. There were dead flowers hanging on the wall in one of the guest bedrooms that had about an inch of dirt on them. The sofa in the living room had several large tears in it and the dining room chair also had tears. One (of the two) bar stools in the kitchen was broken and could not be used. The two bikes in the garage were in a similar state of disrepair. I was able to get one of them functional but was afraid to ride it. The description makes it seem that this unit has beach access. It does not the access across from the complex is specifically prohibited for use of the renters/owners in this complex due to some legal issue when the community was developed. The closest public access is over mile away. Not quite walking distance for most. The 4th "bedroom is technically not a bedroom but more of an office with glass doors that open into the kitchen and into the living room. Traffic noise is pretty bad in the two bedrooms that are on the Gulf side so don't expect to keep the windows open at night. Oh, and don't expect to use the AC to stay comfortable as the owner won't allow it to be set lower than 74 or so. I'm not typically one to leave bad reviews and I don't mind a place that is somewhat run down or needs a little work, but this place was disgusting. I wish that VRBO would allow me to upload photos (I have dozens) so that you can see that I am not exaggerating. DO NOT STAY HERE. Longboat Key is awesome tho. In the nearly 10 years that we have been renting out Castle in the sky, I can clearly state that this was the most difficult rental that we have ever had. The prior two renters had each stayed for a month and within a week of their stay wanted to book for next year. The same cleaners have been cleaning for the past year and never were there complaints of a filthy home. During these renters' stay they complained they needed another light in the family room for reading. There are 12 recessed canister lights and two wall lights already, but to satisfy them we brought a new lamp to use for the recliner. They were upset that the vacuum cleaner was not working correctly so I took a picture of the same Shark vacuum that we have at our home residence to illustrate where there may be a clog. For some unknown reason this infuriated them, so to make them happy we purchased a new Shark Navigator Swivel Plus vacuum. It was tested beforehand to ensure that it worked properly and swapped out for the "broken" one. The canister of the new vacuum collected some dust inside showing that it worked properly. They saw this and figured it wasn't a new vacuum and were unhappy. The "broken" vacuum needed a filter cleaned; that's all, usually not a big deal for most guests. Another request was made for extra blankets; this was surprising since it's not very cold in Florida in March and there are a half dozen extra blankets already in the residence. Also there are comforters on each bed so it is seldom cold enough for any blankets at all. But as in the other circumstances, we took the high road and purchased two queen sized down-alternative blankets for their comfort. They complained that they were not king size. A pattern seemed to be occurring where requests were being made for things that were not necessary or didn't meet their satisfaction. Somehow they were able to survive living in an inch of filth and dust the entire three weeks; they wanted half of their money back at the end and threatened to send nasty reviews to any and all review sites if they didn't get their refund. The chat rooms of vacation websites for owners is full of stories similar to this where owners are barraged with complaints by renters in attempt to get refunds or else negative reviews will be posted. I'm not just an owner but I am a renter when I travel with my family as well so I have some perspective from both sides. Please look at the totality of all the reviews when you are considering this one.